“Plurality and India; Present and future’’ is the theme of the May literature festival being held on 26 and 27 May 2018 in Dharwad. The literature festival has been running for twenty years. They have been successful in bringing together young writers who have been engaged in cultural resistance. Basavaraj Sulibhavi of Ladai Prakashana, a publishing house organises this festival. Yogesh S (YS): What is May literature Festival? And what does the festival aim to do ? Basavaraj Sulibhavi (BS): Ladai Patrike took the form of Ladai Prakashana (Ladai publication) in 2002. The prakashana along with others organises the May literature festival in the month of May every year with the aim of creating a platform for progressive literature in the state. We have been organising literary festivals in the month of May for the last 20 years. Five years ago, we started calling the literature festival Kannada May Literature festival. This is the 5th Literature festival. 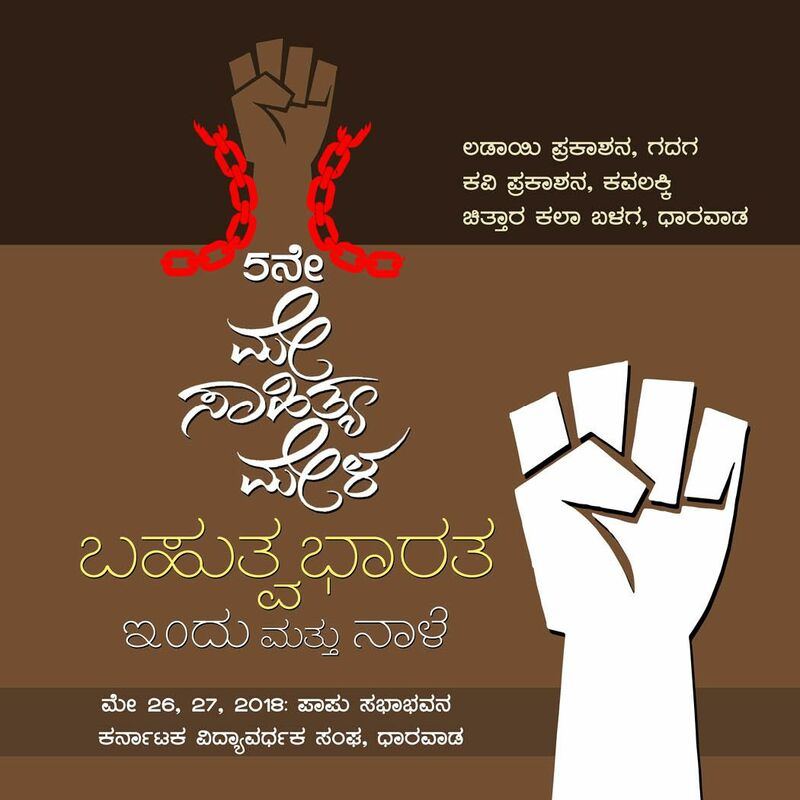 After the Bandaya Literature organisations1 in Karnataka stopped functioning, there were no literary organisations to represent the literature of resistance. This created a big lacuna in Karnataka. Hence, with an aim of bringing together the young and new writers and progressive thinkers in Karnataka and foster a literature of resistance and dissent in the society, we decided to organise the May literature festival. Most importantly, the month of May represents creation of life. The hot scorching summers cannot stop germination of seeds. The image of a plant growing on hot and dry rocks in summers, which is the rule of nature, symbolises hope and resistance. The system we are living in today, resembles a scorching summer. We can feel the heat. Hope and resistance are the need of the times we are living in. Since the month of May is the metaphor of this hope and resistance, we chose this month to bring together those who are involved in building resistance and dissent. History also shows us that the month of May is the month of the workers. They are the ones fighting oppressive forces.It is also the birth month of Karl Marx. We believe that literature should speak about the people and their realities. The festival this year concentrates on the issues prevalent in the country today. Earlier, our theme was the growth of Fascism. This year the theme in Bahutva — plurality. India is plural in its composition. There is no one religion or one language here. The right wing forces are constantly attacking this plurality. They have been struggling hard to establish the dominance of one religion and one language; they also have assumed the authority to order people what they should believe. These forces function under supervision of the ruling government. Since all of us believe in plural composition of this country, we have chosen plurality as the theme of this festival. YS: How according to you, festivals like this should be seen in the light of the Fascist right wing regime now at the centre? BS: The whole country is witnessing the times of fear. It is not only the writers. Anyone invested in creative expression: she could be a singer, playwright, artist, filmmaker: everyone is under attack. The current regime wants to control creative expression by manipulating and controlling its practitioners; and this is widely seen across the country. The system has become intolerant of dissent and resistance. This was the case during other governments too. But there is a difference between then and now. Now it is a fundamentalist right wing government at the centre. The attack on dissent is much more systematic and vehement now. These attacks aim to generate a sense of fear. There is no space for dialogue, or for views which are not in par with that of the ruling party; instead one can see every attempt to snub these views. This is seen only after BJP came to power. One thing we should remember is that the right wing forces have no other tool of their own to counter thoughts and ideology. The only tool that they have is to erase thoughts and ideologies it opposes. In recent times we have seen, the right wing forces, failing to face the powerful voices of dissent, have resorted to murdering those who questioned them. This can be seen across the country and especially in Karnataka. The killings of Kalburgi and Gauri Lankesh are few examples we have. These killings, and the celebration of these killings by the right wing forces operating in the country, make it very clear that their war is against free thinking. YS: As you noted, the right wing government and their fascist ideology has generated a sense of fear among the people. How is the literature of resistance and dissent in the state combatting this sense of fear? BS: It is true that there is a sense of fear prevalent largely among the people in the state, just like anywhere in the country now; but it has failed to influence cultural practitioners in our state. Their writings continue being sharp and frank: Karnataka hosts a strong community of progressive thinkers who are not afraid to say what they want to say and the way in which they want to. We know about 210 instances in Kannada where the writers have not given into the atmosphere of fear prevalent around them. Most of these works are about the functioning of the right wing forces at their centre and all of them can be considered as the literature of resistance. Ladai Prakashana has published many such works from across the state and also has translated many such works. We have received many threats in the past. Neither have their threats stopped us from publishing these works nor have they stopped any writer from writing. If the right wing forces in the country have grown stronger, the forces resisting them have also grown stronger. There is nothing that can stop dissent. The only problem we are facing is that the dissenting voices are not united. They are fragmented. It is this that is making it easy for the right wing forces to flourish. They would go to any extent and join hands with anyone who would help them in establishing their rule. Since all of us who are fighting the right wing forces are divided, it seems as though we are not strong. However, they haven’t been successful in terrorising writers in Karnataka. Kalburgi and Gauri Lankesh were killed to terrorise the writers in the state, but they have failed. None of the writers in the state have stepped back. Instead, the two killings have made the people in the state conscious about the right wing agenda. 1. Bandaya Sahitya or Bandaya literature directly translates into revolutionary literature. It represented the progressive schools of thought in Karnataka.